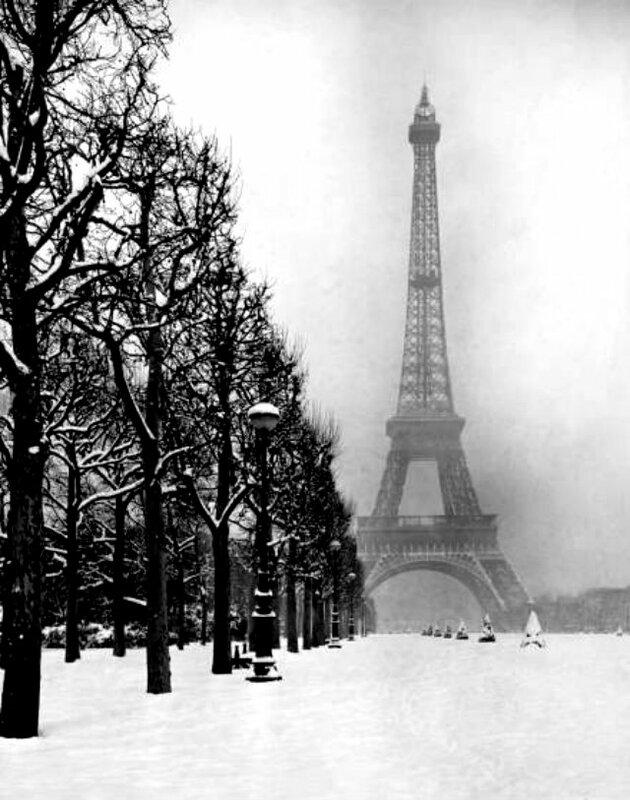 The Eiffel Tower in Winter, 1948. LIFE considers the phenomenal edifice through a single picture: Dmitri Kessel’s classic 1948 portrait of La Dame de Fer as seen on a winter’s day. The popular French writer Guy de Maupassant (1850 – 1893) reportedly ate lunch in the Eiffel Tower’s restaurant every day for years — not because he loved the great iron monument but because, so the story goes, it was the only place in Paris where he could sit and not see the tower itself. Maupassant, like countless French artists and aestheticians of the late 19th century, despised Gustave Eiffel‘s creation, seeing it as a vulgar eyesore and a blight on their beloved Parisian skyline. Whatever. For the rest of the world, the Eiffel Tower is and has long been one of the singular architectural emblems anywhere on earth: a formidable, graceful, soaring structure that connotes Paris as surely and as indelibly as the Empire State Building, Il Duomo, Hagia Sophia and other enduring landmarks signify their own great, respective cities. Perhaps it’s the absence of a single, visible human form that lends Kessel’s photograph its timeless power. Maybe it’s the ill-defined look of the structure, almost phantasmal as it looms in the Parisian fog, that somehow draws the viewer even deeper into the scene — as if, given enough time, the fog itself might clear and, even as we watch, the spire might grow more defined in the stark winter light. Whatever the source of this one picture’s abiding appeal, the tower itself remains undimmed 125 years after awestruck crowds first encountered what was then, and remained for the next four decades, the tallest manmade structure on the planet. via The Eiffel Tower at 125: A Paris Landmark Captured in a Classic Photo | LIFE.com. ← Magical Sunrise in Bled, Slovenia.